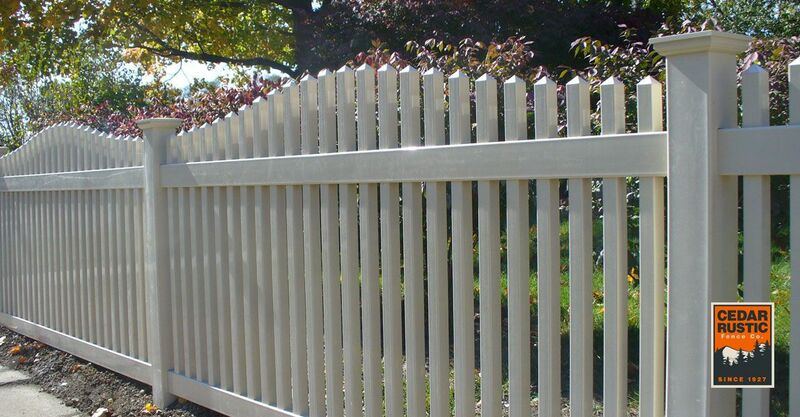 Imagine if we could reproduce the beautiful simplicity of the epic American white picket fence in a durable, maintenance-free material. We can! Cedar Rustic Fence Co.’s vinyl fences look great and last a lifetime. With a Cedar Rustic vinyl fence, you can even go beyond the simplicity of white pickets. 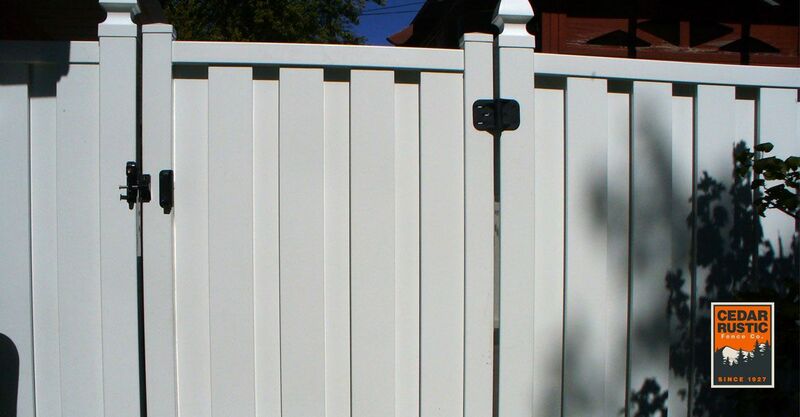 Our fences are available in multiple colors with styles to fit any home – from traditional to contemporary. 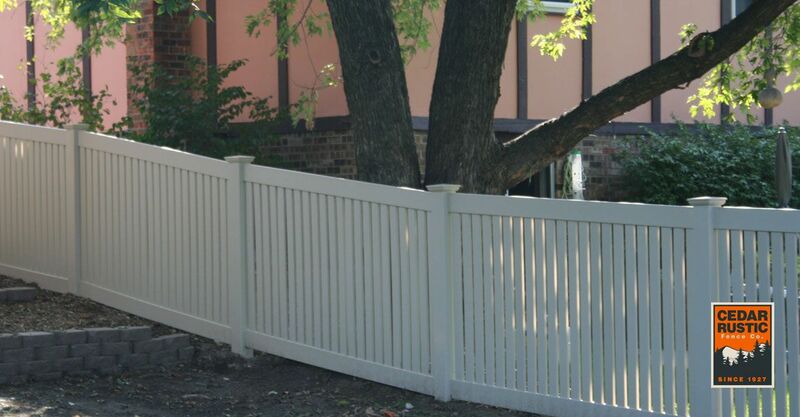 You may not know it from our name, but Cedar Rustic Fence Co. is the largest fabricator and installer of PVC fencing in the Chicagoland area. Each fence is precisely routed on one of our computer numerical controlled (CNC) machines and assembled specifically for you. Cedar Rustic Fence Co. always considers our customers first when manufacturing our vinyl fences. 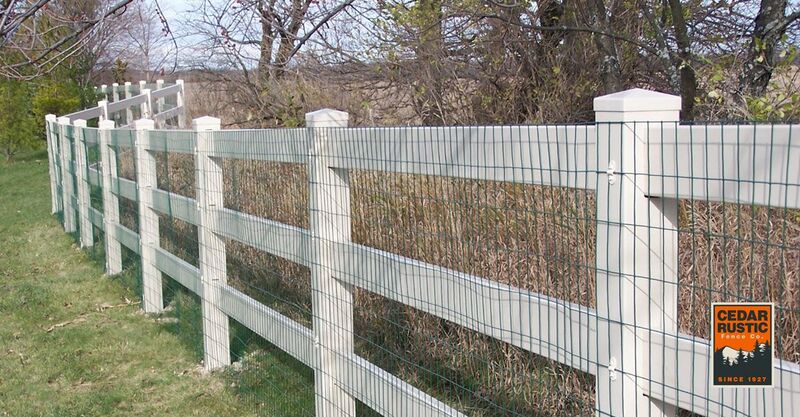 Most fence installers buy vinyl fencing products from third-party manufacturers. These manufacturers are primarily concerned with their profitability and at times will skimp on product quality. Over the last 80 years, Cedar Rustic Fence Co. has gained perspective on the long-term value of customer service. We understand that compromising on product quality today will adversely impact the long-term success of our business. Whether you are looking to add privacy, security or character to your yard, CR Vinyl from Cedar Rustic Fence Co. is the right choice for you. Our lifetime warranty is the most comprehensive in the industry. 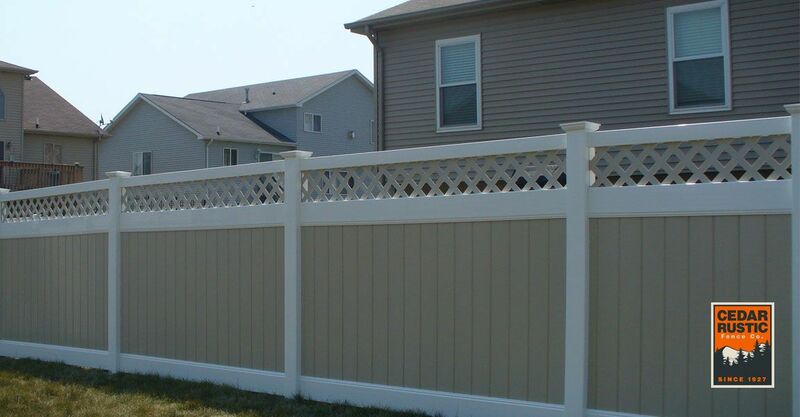 We guarantee your vinyl fence will never chip, peel, warp or fade unevenly. If it does, we will fix it at no additional cost to you. 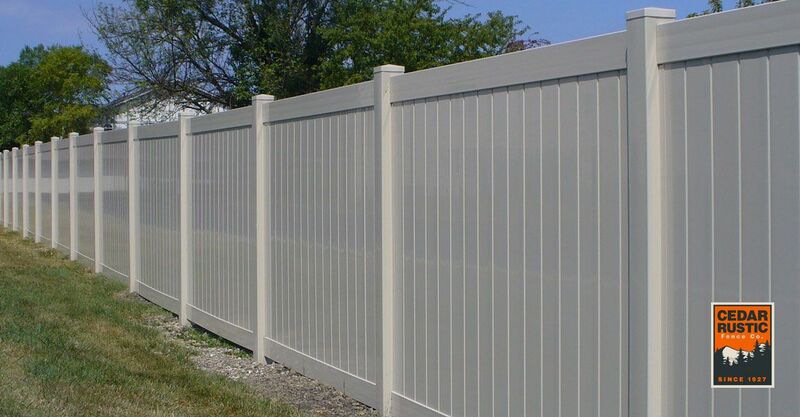 Add charm to your yard and value to your property with a vinyl fence from Cedar Rustic Fence Co.
Bring the beauty of your backyard out with a maintenance free PVC fence. Our 4’ white cottage fence is constructed using 7/8×3” pickets with dog eared caps using 5×5 post with New England caps. This fence is constructed with scalloped pattern. 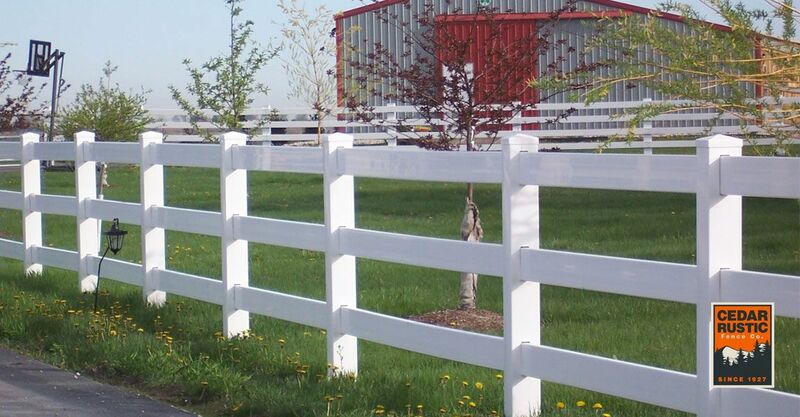 The vinyl rail fence is a perfect addition to this farmhouse, without any maintenance needed. 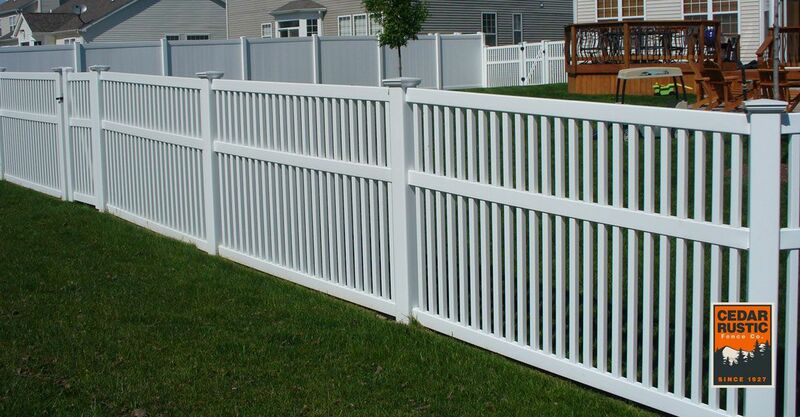 The fence is constructed using 5×5 vinyl posts and 1 ½ x 5 ½ rails. This style also works well around parks. The fence installed on this property gives both security and style for the homeowner. It has 2×4 wire clipped to a 3 rail vinyl fence. This wire allows visibility and security while the vinyl 1 ½ x 5 ½ rails add elegance. The 4×4 posts are finished with New England caps. 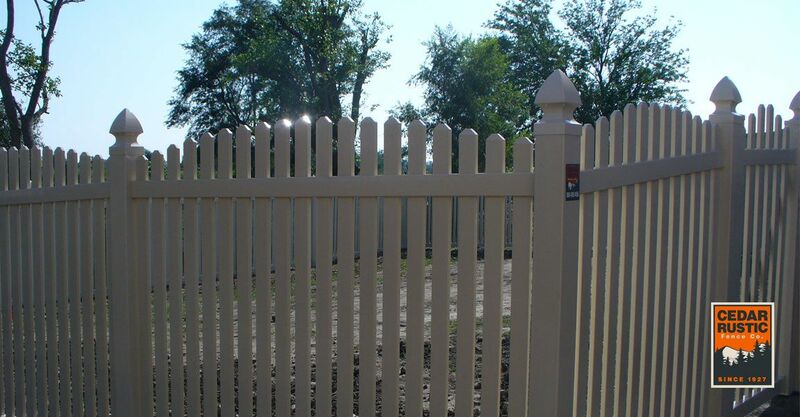 This lovely 6’ cottage tan spaced traditional fence will add so much beauty to any yard. Constructed using 7/8 x 3” pickets, 5×5 post with New England caps, fitted construction with a 4/2 stack to give it a unique look. Our 4’ cottage PVC tight spaced arched fence will add tons of beauty to your yard. 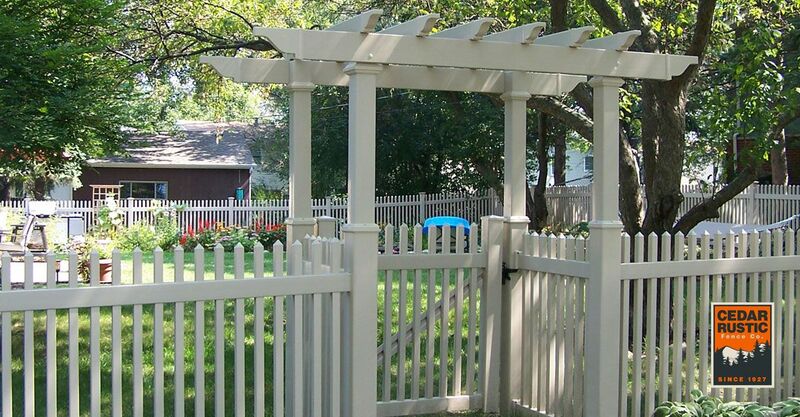 Shown above, and constructed using 3” pickets, 4×4 posts with Gothic caps, fitted construction, 2x 3 ½ rails, and spade picket tops, this fence is also a great maintenance free option for those who own small pets. Looking to secure your yard, while still being able to showcase the beauty of your yard? This 5 foot Madison traditional fence, with 7/8×1½ pickets, 2×3½ rails, 5×5 posts topped with New England caps, and 3/2 stack, might be the perfect fit. 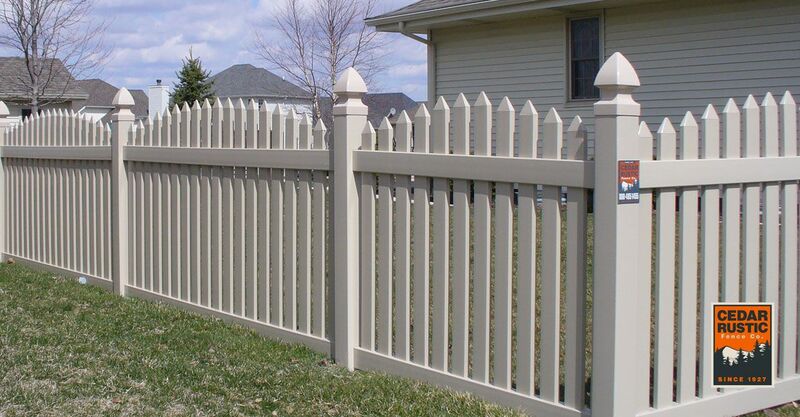 This scalloped spaced picket PVC adds beauty and character to any yard. 4 foot tall Madison is perfect for protecting your children or pets. The steel framed gate is constructed by Cedar Rustic so it will match your fence perfectly. 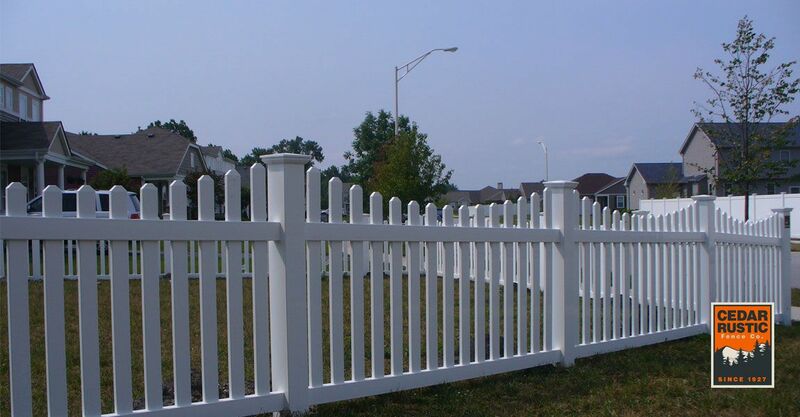 This is a classic almond vinyl picket fence with a four post arbor. The arbors are all constructed by Cedar Rustic so they will last a lifetime just like your new fence. Back line: 5 foot tall Lexington almond scalloped tongue and groove base with 7/8×1-1/2 pyramid top. 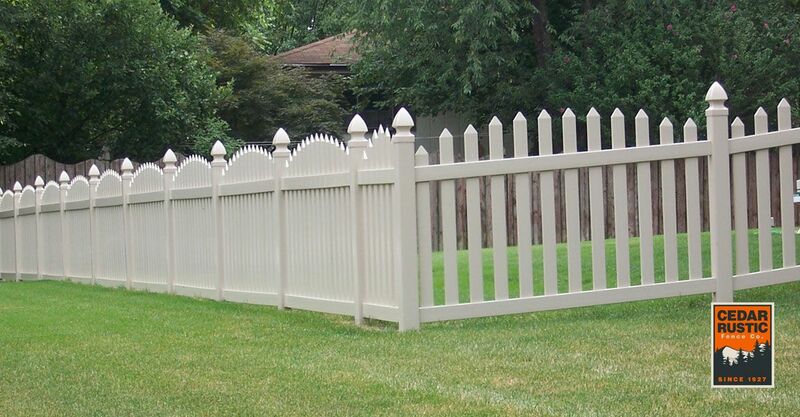 Side line: 4 foot tall classic almond scalloped fence with 1-1/2×1-1/2 pickets adorning pyramid caps. 4 foot classic spaced picket 1-1/2×1-1/2 with pyramid caps, with 4×4 posts and New England caps. Keep small dogs in your yard with this 4 foot classic flush bottom PVC fence with 1-1/2×1-1/2 pickets spaced approximately 1-1/2” apart. 5 foot tan cottage 7/8×3 tight spaced dog eared picket caps constructed in an arched pattern. 5×5 posts with Gothic caps are used to support the fence. Looking for that white picket fence without all the work? Look no further. 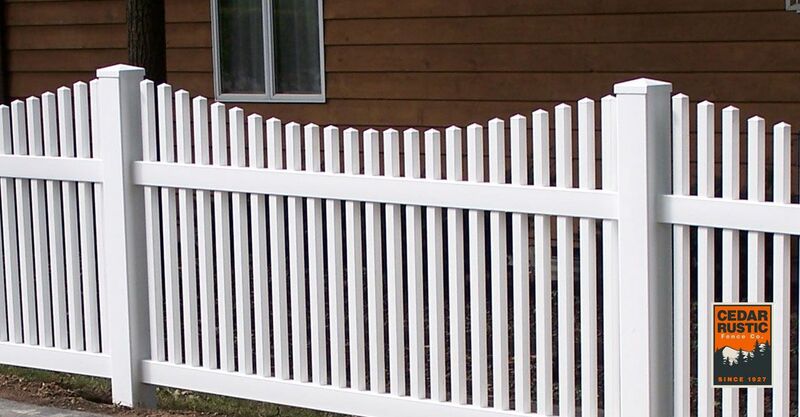 Cedar Rustic offers a 4 foot tall white vinyl cottage fence with 7/8×3” dog eared scalloped pickets that requires no maintenance. Here is a straight top cottage fence with spade pickets and 4×4 posts with standard flat caps. Our vinyl sections are rackable allowing a smooth transition between grades. Notice how the fence follows grade but the top of the fence lines up as well. Other companies may only offer to step the sections down, causing jagged drops between sections. This is a 4 foot tall arched Cottage fence, using 3” spade pickets and Gothic posts constructed with Tan vinyl material, also available in white. Don’t let our name deceive you; Cedar Rustic specializes in quality installation of vinyl fences, as well as cedar, chain link and aluminum. We offer a variety of options and styles to choose from. Above shows our Lexington Estate privacy paired with our Classic spaced picket fence. The vinyl privacy is constructed with our interlocking tongue and groove boards and deco rail. The Lexington topper pulls the two fence styles together. 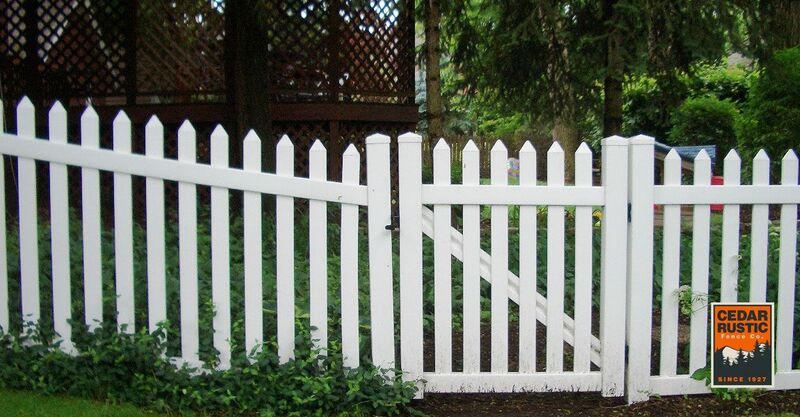 Looking to complete you yard with a white picket fence? 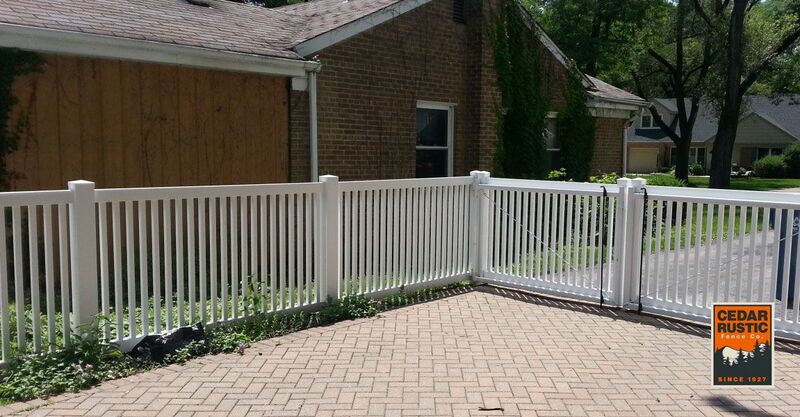 Installing a vinyl fence is a great maintenance free option. Our Cottage style is constructed with 3 inch boards, 2×3 rails, and 5×5 posts. This picture shows the straight top design with standard flat caps. Although vinyl fencing costs a bit more than a wood fence, it is a great option, as it is maintenance free. You no longer have to worry about staining and treating a wood fence as well as replacing posts over time due to rotting and other elements. This is a 4 ft scalloped Cottage fence with New England post caps. 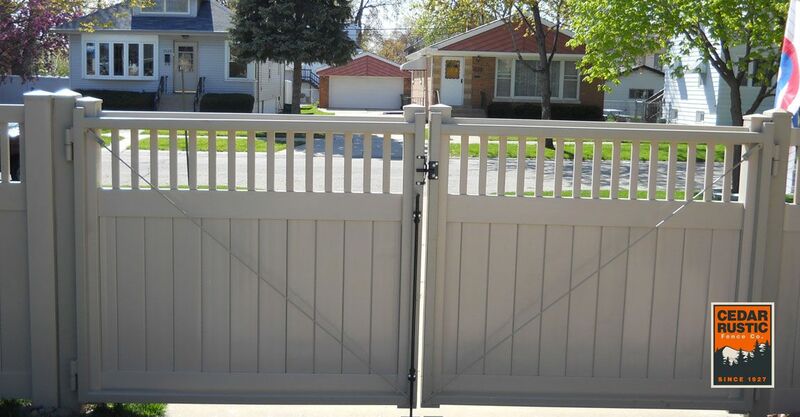 Since all of our fences are fabricated at our facility, we are able to offer fences shorter than 4 ft, which maybe considered special orders elsewhere. 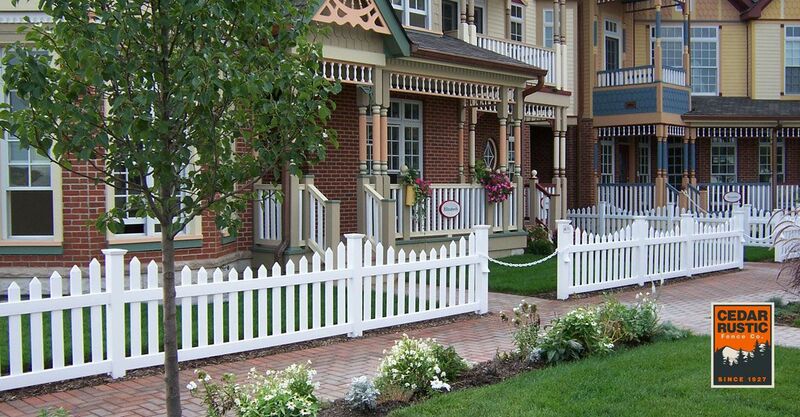 This 3 foot scalloped cottage style fence, constructed with a 3 inch spade picket and accented with New England post caps, adds the perfect finish to these Victorian homes. 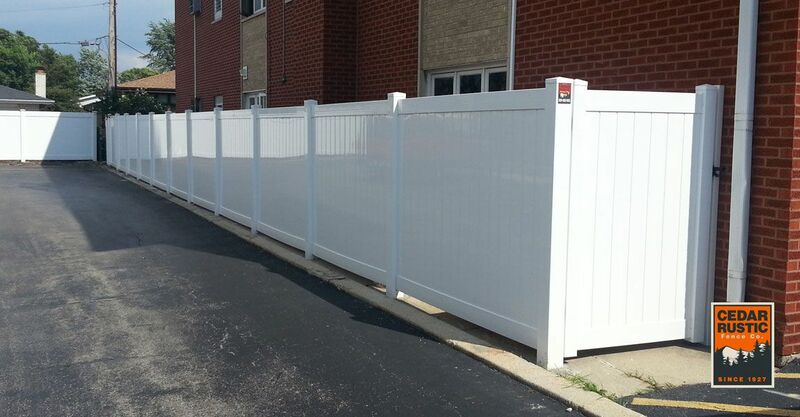 This is a 6 foot tall shadow board white vinyl fence. The shadow board or shadow box style of fence provides privacy for you while giving some depth and dimension to the fence. 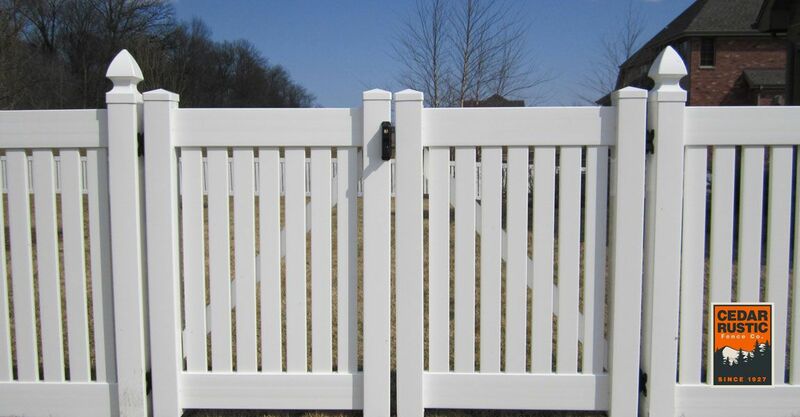 Our vinyl gates are all constructed using 4×4 gate ends with standard flat caps. The rails are inserted inside each gate end and reinforced with a gate brace. 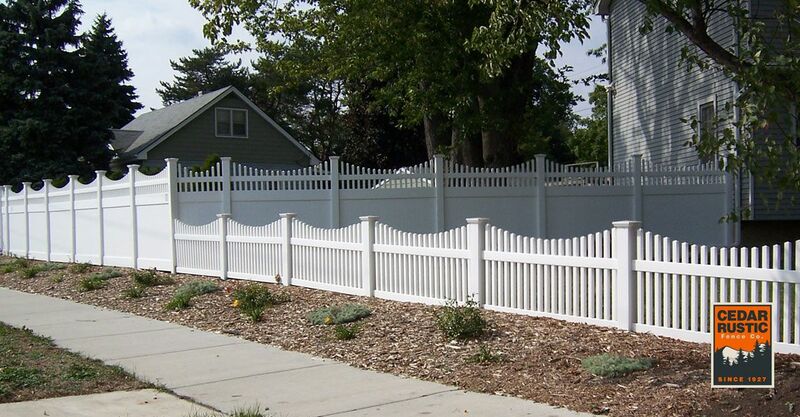 This 4 ft tall white vinyl fence is our Manor I style with the Gothic post cap option. The 6 ft wide double gate allows larger equipment to access the yard easily. Don’t have a flat yard? No problem! Cedar Rustic fabricates panels that are rackable to follow most grades. This is a 4’ Manor I with 5×5 posts and New England caps. This is a four foot tall semi-privacy almond fence. 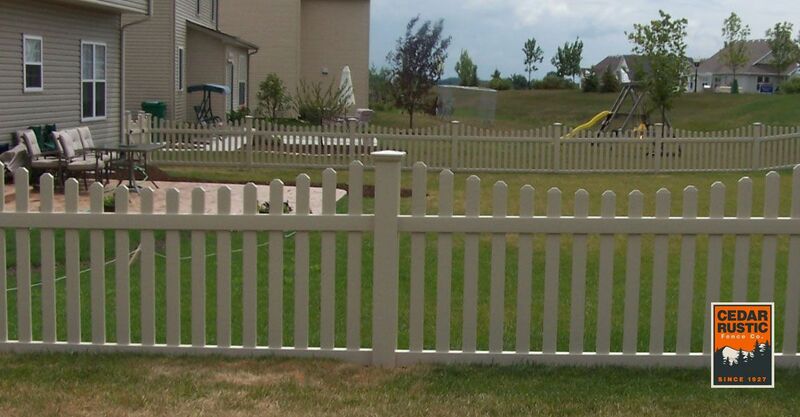 The alternating pickets add character and interest to the fence. Looking for privacy but don’t want to feel closed off. Consider a semi-privacy fence from Cedar Rustic. 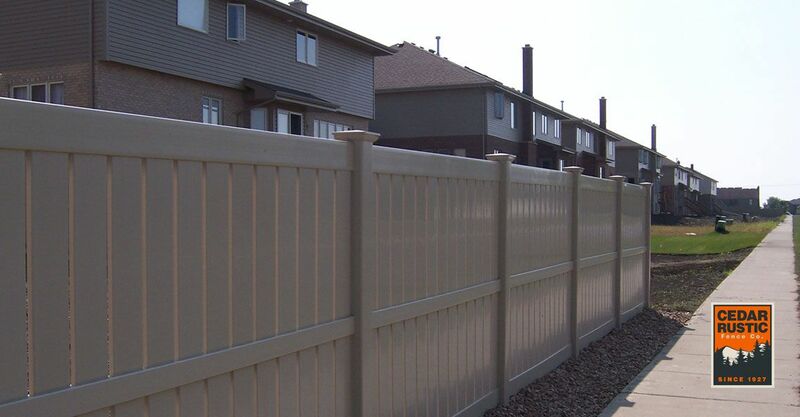 We offer 6 different styles of semi-privacy fences in a number of different heights. Call us today and we can help you choose a style to match your needs. Cedar Rustic can create custom steel-frame gates for almost any purpose, using cedar or vinyl. 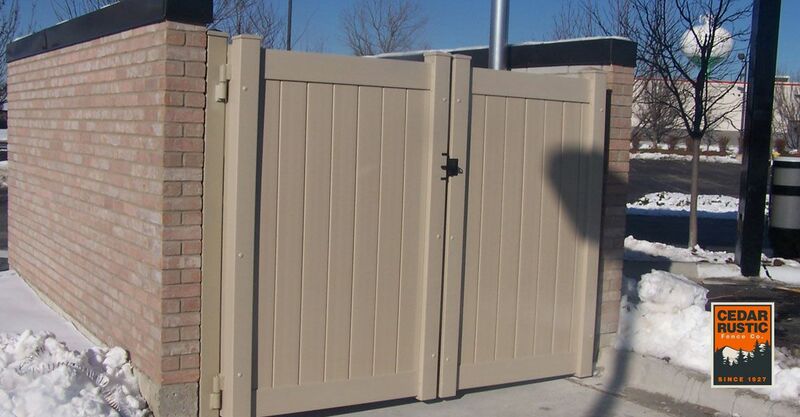 Show above is a 6’ vinyl privacy steel-frame gate installed on a dumpster enclosure. An elegant estate vinyl privacy fence was installed on this homeowner’s property. It has 5×5 posts finished with flat caps. The fence has been constructed with 1 ½ x 5 ½ rails and tongue and groove vinyl pickets. 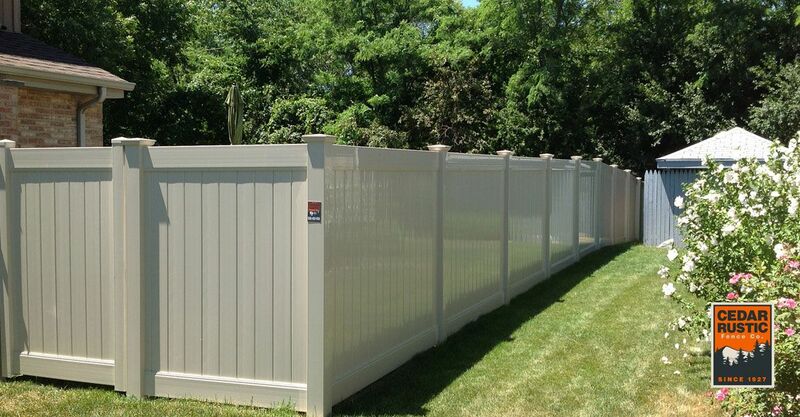 An Estate privacy fence is perfect for any backyard functions. The vinyl allows for low maintenance and beauty. The decorative New England caps rest upon 5×5 posts. The tongue and groove boards are fitted nicely to 2×7 Deco rails. Do you have a driveway that you want to fence in? Consider a steel framed gate from Cedar Rustic. We custom fabricate all of our steel frame gates to match the fence style and size the gates you require. These gates and hinges are fully welded so you don?t have to worry about sagging gates. Looking to keep out those prying eyes? 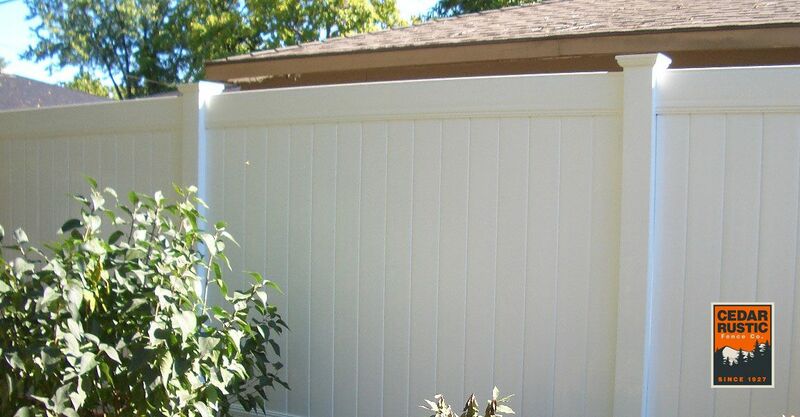 This beautiful white 6’ vinyl privacy fence, with its tongue and groove construction and decorative New England post caps, could turn your yard into the perfect quiet retreat from the outside world. 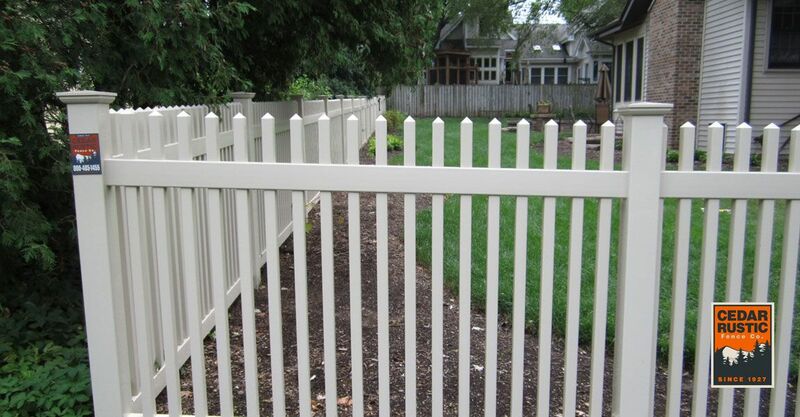 The 6’ tan Hampton Estate tongue and groove fence, shown here with 1 ½ x 5 ½ pocket rails, 5×5 posts, and New England caps, can add privacy, security, and beauty, to any yard. If you are looking for maintenance free with total privacy, this is the fence for you. 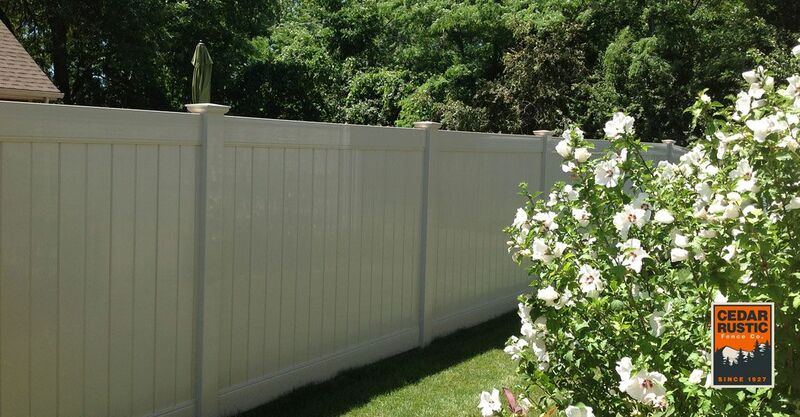 This 6’ estate privacy white vinyl fence is constructed using tongue and groove boards, 1½ x 5½ pocket rails, and 5×5 posts with external flat caps. 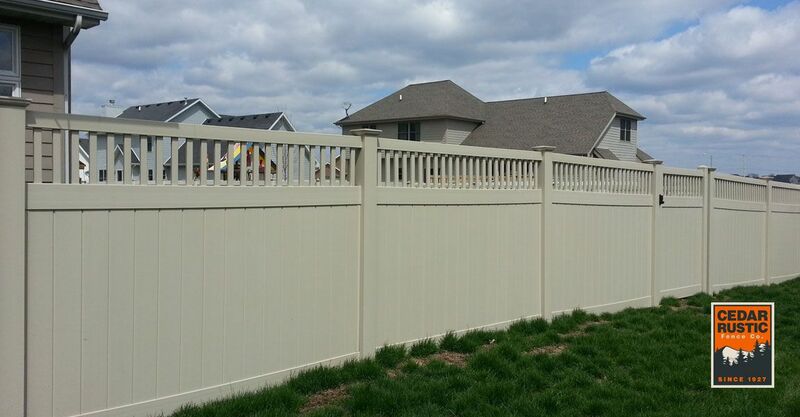 This homeowner chose a decorative version of privacy fence using white and tan vinyl with a lattice top. It has 5×5 posts with simple but elegant New England post caps. It has tongue and groove boards with 2×7 Deco rails. 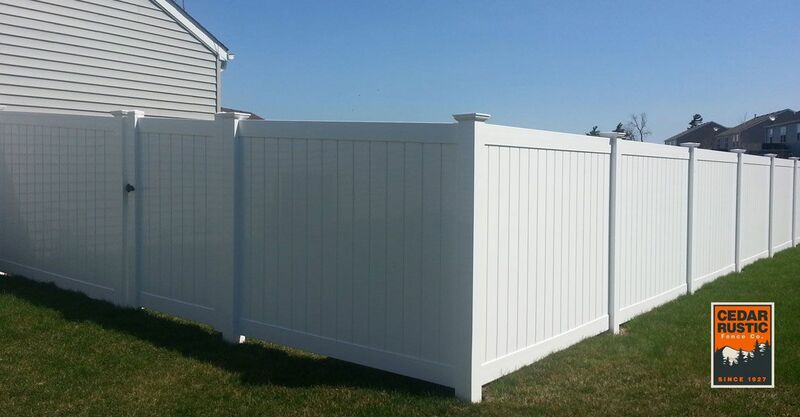 Crisp white vinyl privacy fence with 5×5 posts adorned with New England caps. 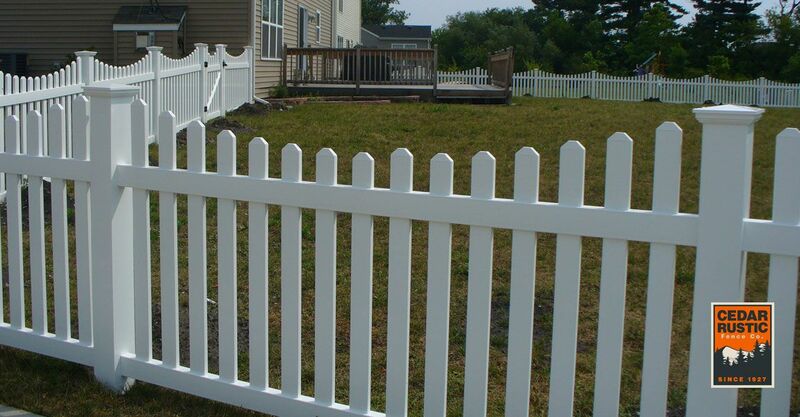 All of our PVC fences have the best warranty in the industry. 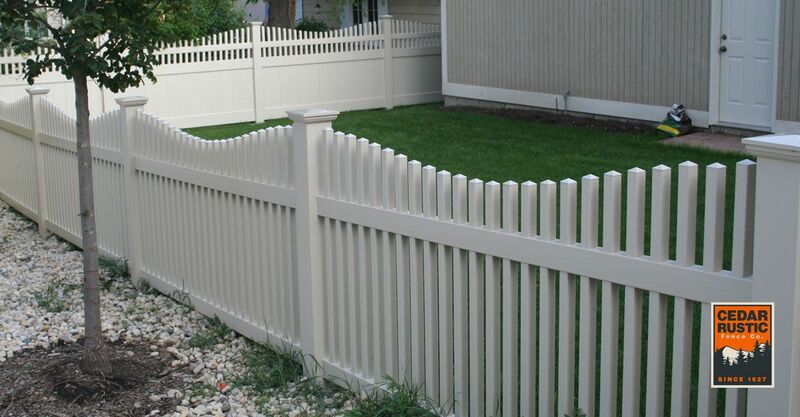 This beautiful vinyl fence with deco top and bottom rails is a beautiful addition to any backyard. 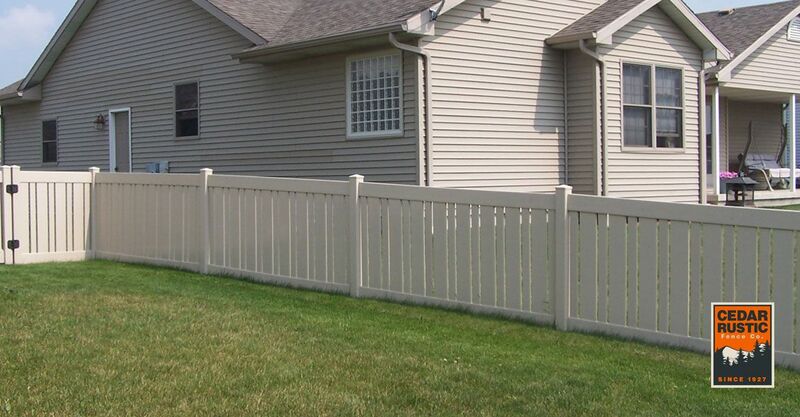 Cedar Rustic Fence Co. Vinyl fence installations are warranted for three (3) years against defects in workmanship. Gates, gate closures and locking mechanisms are warranted for one (1) year against defects in workmanship. Cedar Rustic will also cover labor cost associated with resolving legitimate warranty claims described by the Westech warranty below and approved by Westech. Labor costs are limited to the direct cost of repairing the fence. This does not include ancillary costs that maybe required. These costs may include, but not limited to, landscaping, concrete or asphalt work, utilities, or any exterior siding or drainage costs. The labor warranty is only valid for fences installed by Cedar Rustic. Choosing a fence and deck contractor can be a formidable task, but at Cedar Rustic Fence Co., we make the choice an easy one. 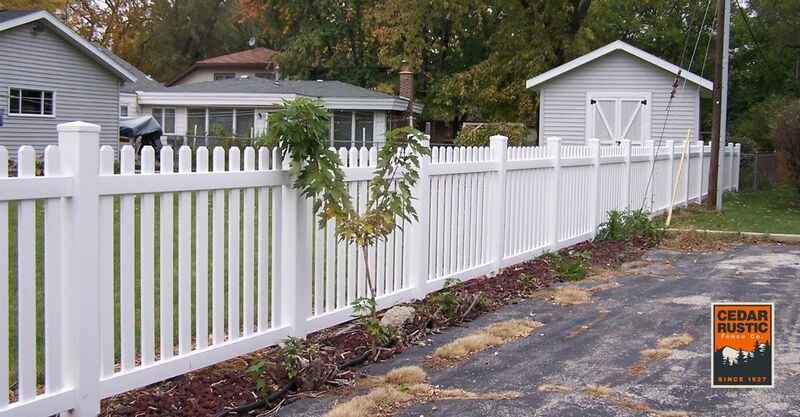 We have been serving Joliet, IL and the Chicago land area faithfully since 1927, giving our company the privilege of being the oldest fence company in the area. 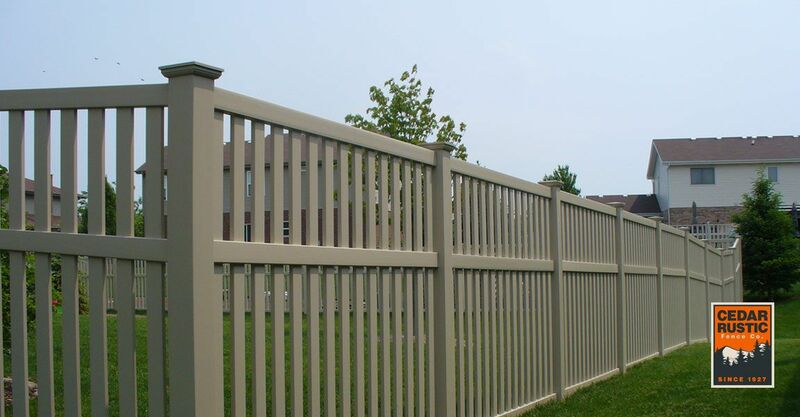 For almost 90 years, we have provided top-quality fence manufacturing and installation services for residential and commercial customers in this part of Illinois.